This past week has been pretty busy with school wrapping up for the summer and my nephew's graduation ceremony. School is out now, and we have been enjoying slightly later mornings, and getting into the summer schedule. I am looking forward to catching up on my blog posts as well as starting some new projects this summer. Last week I made a soup that I had been wanting to try making for quite some time, Chicken Corn Chowder. 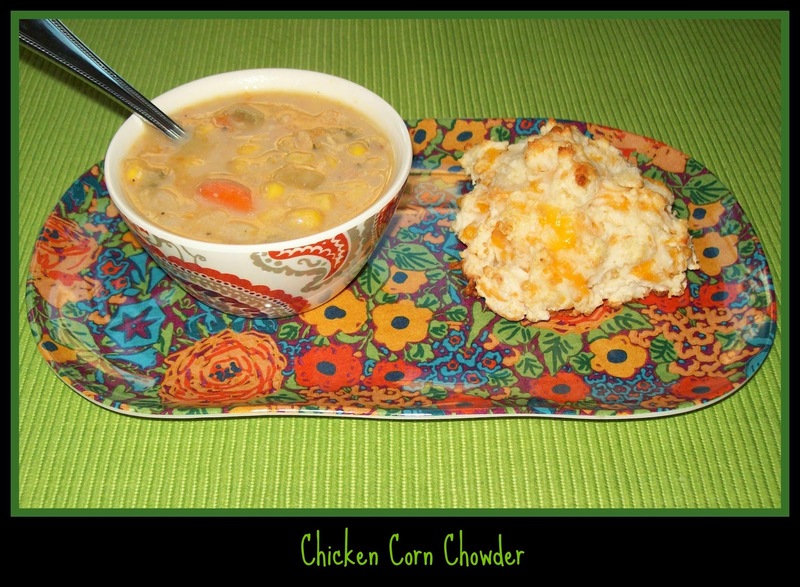 We all love chowders around here, and sweet corn is one of my husband's favorites, so I had a feeling it would be well received, and it was. 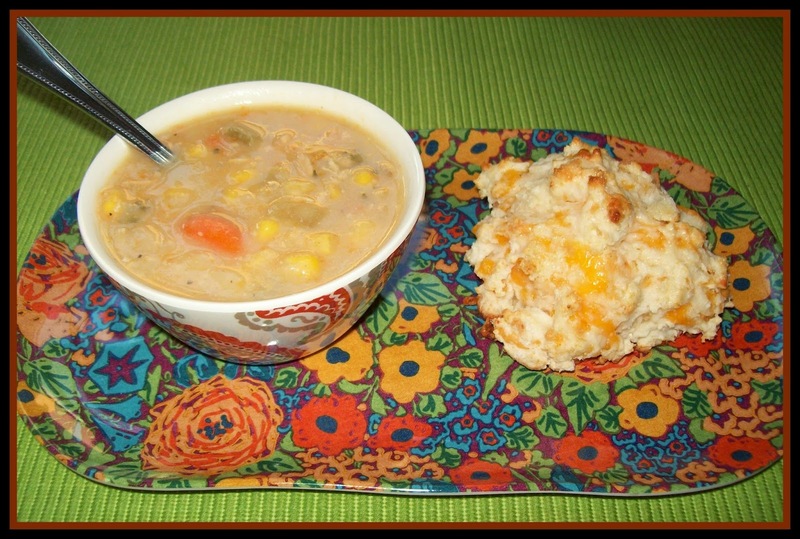 Here is my recipe for Chicken Corn Chowder. Add broth, chicken, celery, onions, carrots, and potatoes, along with enough water to cover ingredients. I add water to all of my soups throughout the cooking process as it steams away, and to stretch the soup to the size I want it to be, I never really measure, and I just adjust seasonings to make sure that the soup is flavorful. Salt and pepper to taste. Bring to a medium boil and then turn down to a medium low and let the veggies and chicken cook through. (To speed this soup along you can saute the onions and celery in a little butter or olive oil until they are translucent, and use precooked chicken.) When the veggies and chicken are cooked through, remove the chicken and chop it into bite sized pieces, and add it back in the pot. Drain both cans of corn and add it to the chowder. Check seasoning, and flavor, add more salt and pepper to taste, I also like to add a teaspoon of granulated garlic or press in a clove or two of fresh garlic, just enough to give it a hint of garlic. Stir in two cups of whole milk. Let simmer for at least half an hour more, and check seasoning. Then instead of thickening this soup with a thickening roux like I normally do, I decided to thicken the chowder with instant potato flakes, I started with one cup of unflavored instant potato flakes, stirred it into the soup and let the soup simmer a bit, then added more instant potatoes as needed to thicken soup to the desired thickness, let the soup simmer in between adding the potato flakes in smaller amounts so it has time to spread to the soup and thicken it, you don't want to add too much. This is a nice and easy way to thicken a chowder. Check seasoning again, perhaps add a little more salt and pepper. Once soup has been thickened you want to stir it frequently and not leave it on the heat for too long so the bottom doesn't burn. I like to serve all of our chowders with a little pat of butter on the top- delicious! I also made up a quick batch of cheesy garlic drop biscuits, just following the directions on the Bisquick box, and they were delicious with the chowder. You might also like to try my other chowder recipes Mushroom Chowder, and Cabbage Chowder. Now for a quick update on the garden. Last week I decided it was warm enough to get my direct sow seeds planted, I planted a new variety of green bean, three types of summer squash, and a variety of pumpkins, as well as a few radishes. Some of the green beans have not germinated, so I will replant the spaces missing green beans. All of the squash, both the summer varieties and acorn squash and pumpkins have all germinated very well, I will thin them out early next week. I am really looking forward to having pumpkins this year, I am looking to seeing how well they do in a smaller garden. 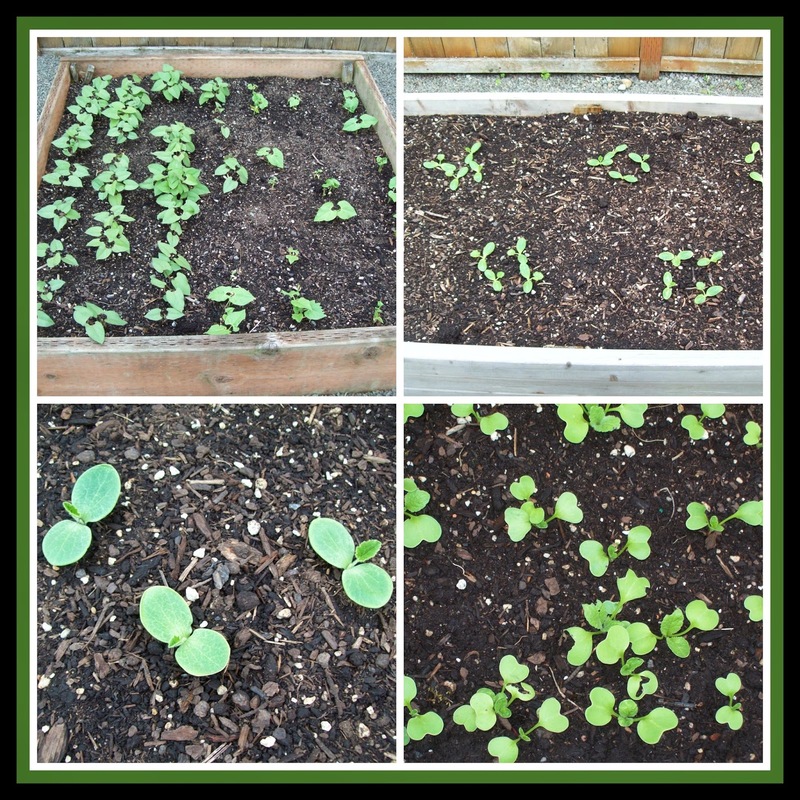 All the radishes are up and have been thinned, some little critter is nibbling on them, but I am hoping since radishes grow so fast they will grow before they have been nibbled to the ground. :) Seeds never cease to amaze me, every year, planting them and watching them pop up through the ground, always amazing! 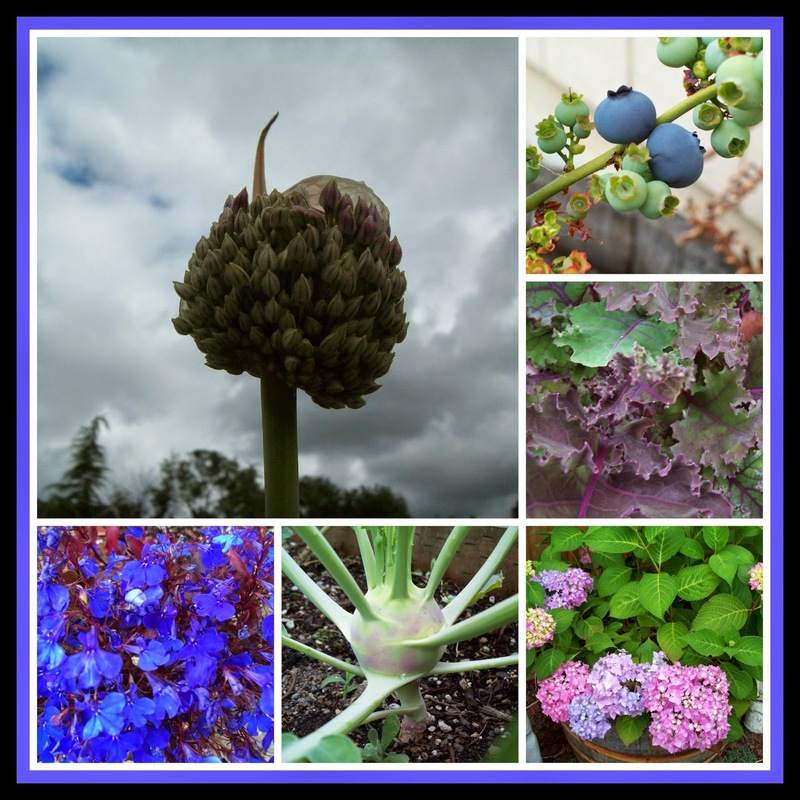 The weather has been gray and rainy the last two days, which is good for the garden, all of the purples and blues in the garden looked beautiful out in the gray weather. The elephant garlic bulbs are about to flower (at least the two I am letting flower, they are so tall I can't wait to see them bloom), the blueberries are starting to ripen, the purple kale leaves are a pretty color, the kohlrabi is getting bigger by the day, and the lobelia and hydrangea are adding a lot of color to the garden. 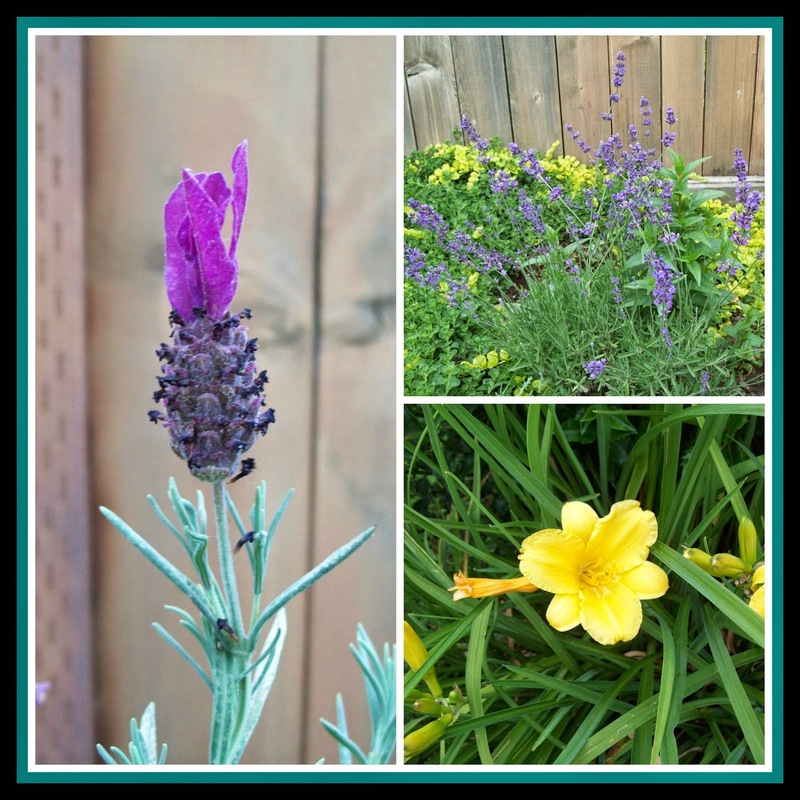 The lavender is still beautiful, and blooming regularly, we have a couple of varieties in the garden right now, and of course the stand by summer day-lilies are brightening up the garden with their daily bright yellow flowers. Love corn chowder and your recipe sounds wonderful and I am jealous that your seeds are coming up.. No signs of ours and I think I may have to replant. Thanks for sharing on Foodie Friends Friday and I hope that you will join us this week for our special 100th party. I too love the magic of watching a seed sprout. It never gets old. Happy gardening!